According to Gartner, a midsize enterprise is an organization that has about 100 to 999 employees. And large scale enterprises, as most sources suggest, are corporations or organizations that have 1,000+ employees. Sometimes, 5,000+. That’s why recruitment in such companies has its specifics and unique challenges. Now, because the average employee rate is considered to be 10%, these huge organizations see a good number of people leaving all the time. For a large enterprise company with about 5,000 employees, the number of employees leaving stands at a whopping 500 every year. That’s almost 40+ vacant positions to fill each month. And all this hiring is just to make up for the attrition. Of course, growth goals also create new jobs and need more hires. As you can probably tell, enterprise recruiting is no easy job. Because large scale enterprises often have multiple offices, the aspect of multi-location hiring and managing multiple hiring teams gets added to the hiring process. Also, the roles being hired for are very diverse — you need everyone right from the C-suite director who’s just retired to the entry-level recruiter you need asap. It doesn’t matter if you’re an independent recruiter serving large scale enterprises or an in-house recruiter for one, hiring a good employee for an enterprise is always challenging. So let’s see seven ways you can optimize your hiring process to meet your large scale enterprise hiring targets. Your recruitment tech powers your recruitment strategy. Which means a strong recruitment tech stack is a prerequisite to successful enterprise hiring. As an enterprise, building this hiring tech stack isn’t a problem for you as you have the budget to go for the “enterprise plans” for all of the software you need. But the problem is getting everyone on board as there are too many people involved in the decision-making process. • Who are the people who would vet the options? • Who would attend the demo? • Does every concerned person contact the vendor with a list of requirements? • Who gives the final go ahead? And so on and so forth. You get the idea, right? A good way to go about this is to first establish the key considerations when purchasing recruiting technology and then setting up a process to follow each time any hiring tech is needed. And when it comes to the solutions themselves, it’s best to go with vendors that offer products suitable for handling a high volume of candidates, multiple roles, and locations (which are the absolute essentials for enterprise recruiting!). Here are examples of some cool enterprise recruitment software vendors who understand your unique enterprise recruitment needs. Your tech stack will consist of various solutions for different tasks such as job advertising, screening, pre-employment assessment, onboarding, and more. Once you’ve found a process for building a recruitment tech stack, work toward building a balanced stack with a special focus on the pre-employment screening stage. Well, because the pre-employment screening stage is where most of the automation can happen. For example, without getting any more recruiters involved, and by using an AI-powered solution, you can screen thousands of applicants for a large number of skills and qualities. This doesn’t just save you tons of manual efforts but also eliminates bias (that we like to believe we don’t carry, but subconsciously we do!). Optimizing your pre-employment assessment in your enterprise recruitment process will help you identify the most qualified candidates early on in the process and save you a lot of time on weeding out applicants who are not qualified for the role. Once you’ve found the candidates who have the required skills, your hiring team can evaluate them for organizational or culture fit. The sooner you get the qualified candidates to this round of the hiring process, the sooner your hiring will happen. Now, because global enterprises have offices in multiple locations, they need to think ‘glocally’ when planning their hiring strategies. Which means a hiring strategy that gets you the best talent for your Las Vegas office may not be that effective to get you the best talent for your Amsterdam office. For example, there are differences in the job markets, candidate motivations, expectations, and more. On a more granular level, there could be challenges like localization. So, for instance, your Berlin hiring team would need to use German to attract and engage the best local talent whereas your Amsterdam team could use Dutch for the same purpose. Furthermore, hiring across multiple locations and departments needs the hiring teams to communicate and coordinate more often. Whether it’s the chief recruitment officer developing operational priorities and objectives for the local HR teams from the different offices or the hiring managers coordinating with the external recruiters, effective communication sits at the center of your enterprise recruitment process. To facilitate better communications, all your hiring teams should try to get more facetime with each other. Not just that, you should also make sure that the recruiters have a thorough understanding of the jobs for which they need to recruit. Regular check-ins can be very helpful here. Also, building a feedback loop where hiring managers and recruiters engage routinely can further contribute to optimizing the recruitment process. 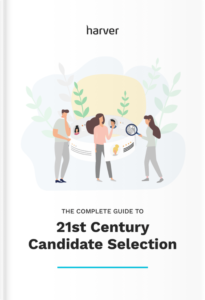 Learn how you implement a modern candidate selection process, that is: streamlined, experience-driven and backed by data. There’s no question that, as an enterprise, you have some of your industry’s best packages. BUT money alone is no longer the #1 criterion for most potential candidates, especially if you’re targeting Millennials and Gen Z. Because these candidates are looking for everything right from good compensation and growth and development opportunities to a great work-life balance, and everything in between. Plus, don’t forget that with all the startups emerging, you’re competing not just with companies of your scale but also with these “cool-places-to-work-for” for the same talent. These companies offer their employees perks like flexible working times and remote work — things you possibly can’t always accommodate. Here’s where building your employment brand and showing how working for you can transform the lives of the candidates helps. Showing the candidates how innovative your company is, creating and optimizing a great careers page, routinely engaging on portals like Glassdoor, and offering good candidate experiences are a few ways of building a strong employer brand. …yet only 55% have a proactive employer brand strategy. Employer brand can be your competitive advantage on the candidate-driven job market. At the beginning of this article, we saw how an enterprise is always hiring for tens of positions. All the time. Which means each time you post an ad, you get applications from people who are interested in working for you. On average, a corporate job ad receives about 250 applications. Which means that with each ad, you can grow your talent base stronger by many applicants. Of course, not all of them would be good fits but a good percentage would be. Your pre-screening solutions can help you spot the promising ones easily. Besides, some of them could even be good fits for roles the you have further in the pipeline. Building a talent base of these all these applicants is a good way to have some candidates on your speed dial. To keep growing this base, considering adding a signup box to your careers page and encourage potential candidates to join. They will be the first to know about new openings, events and developments at your company. 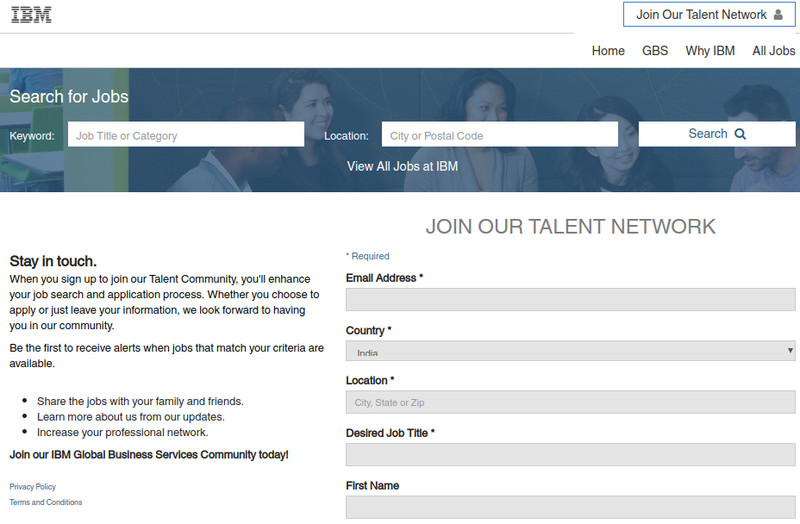 IBM’s talent network featured on their careers page. And Google is not alone. Just look at the top players in your industry and see if they run internship programs. If they do, you should be running one too because the #1 reason enterprises run internship programs is to discover and engage the top talent before they’ve even started searching for a job. Also, these enterprises treat internship placements pretty much like they treat job placements. In addition to running internship programs, you should engage and hire college graduates. They may not have all the experience, but they’re full of energy and eager to learn. So once you find those who have the skills and might be a good cultural fit, you could start investing in helping them grow in their careers. (By the way, support in career advancement is also one of the key things candidates look for when considering a job offer.) Leadership development programs are a great way to do this and raise the managers of the future. Google offers internships in departments across the company. Many companies resist the option of working with external recruiters. You can understand this because, typically, recruiters charge anywhere between 10-35% of the base salary of the position they hire for. So depending on the position being filled, this is a BIG investment. That said, for an enterprise, engaging a recruiter or a recruitment agency can be huge help. Because it offers incredible support to the in-house recruiters and hiring teams who face the pressure of hiring for tens of positions each month. From identifying and connecting with the eligible candidates to screening and supporting your in-house resources through the selection process, external recruitment support can do a lot of heavy lifting for your hiring team. One of the best ways to prepare for enterprise recruiting is to stay on top of your industry news and trends. For example, when the European Union passed the GDPR, suddenly every company that collected or used any kind of user data needed a “Privacy Officer”. Now, of course, the GDPR itself was no sudden development. Everyone saw it coming and knew what to expect. By just being a little proactive on the industry developments like these, you can predict your enterprise hiring needs much better and make better hires as a result. For instance, if your enterprise is also working toward gaining higher operational efficiency by adopting digital transformation — like most of the companies — then you know you’re going to need more data scientists, DevOps and other roles. So stay on top of where your industry is heading, because you too will need the same resources your competitors are going to need. 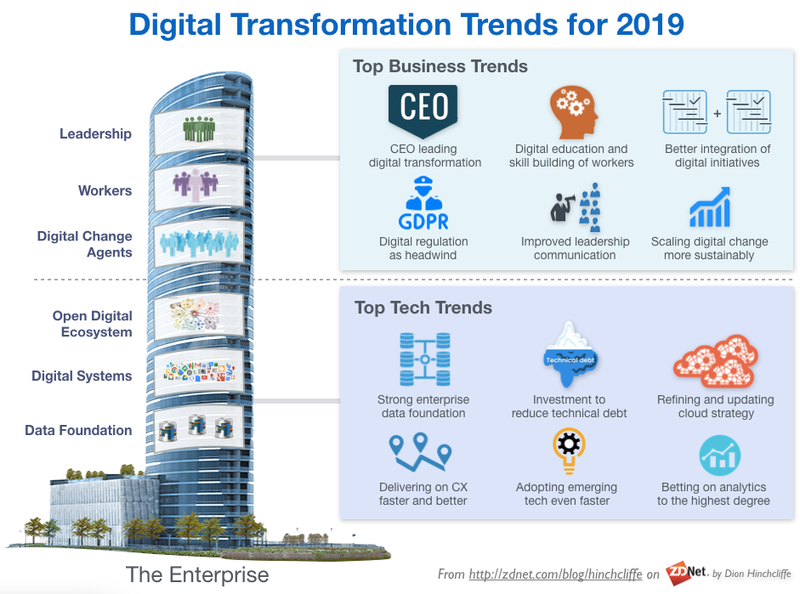 These are some of the trends that will rule digital transformation in 2019. Keeping up with recent developments in your industry will help you predict what comes next and plan your recruitment efforts accordingly. In addition to following the enterprise recruitment tips from above, make special plans for recruiting for positions that are known to be “difficult to hire for”. So, for instance, if you notice a position to have an unusually long time to hire, find better ways to hire for it and speed up your hiring process. Maybe you could tap into a network of recruiters for it or look for some other way. Every industry has positions that are difficult to hire for, so put a red circle around these positions in your enterprise and finetune your recruitment strategies for them.